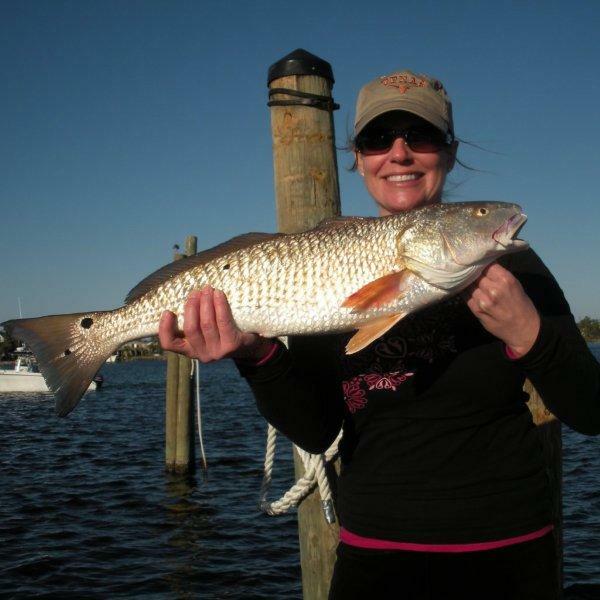 Redfish have quickly become one of the most popular species of fishing targets along the Alabama Gulf Coast. These fish range in size from 2 to 30 lbs depending on the time of year and what location they are caught. Known for their "bullish" fighting antics, Redfish will give you all you want and sometimes more. " I can't do this, " is something I've heard more than once (this week) while catching these magnificent fighters. Sometimes, like with most Alabama inshore species, Redfish will be scattered around an area and you have to wait on bites. Other times, when the conditions are right, like with most Alabama inshore species, Redfish will " stack up" on a particular spot. 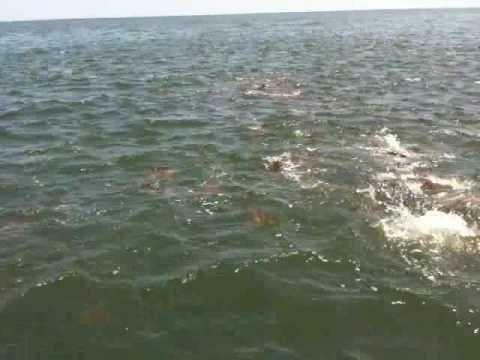 When Redfish are together in large groups, they are very competitive feeders. Both of these scenarios offer their own brand of excitement. Whether it's the sudden, unmistakable bite of a redfish taking you buy full surprise or watching multiple reds fight over your bait, each will have you longing for more. How, When and Where We Fish For Redfish? There are several methods for catching redfish. I would have to say that fly fishing is my favorite. In the spring and early to mid summer, our scattered islands and flats areas produce nice slot sized reds. In the fall, the "Bullreds" show up along our beaches in great numbers and provide ample opportunity for the fight of a lifetime on a fly rod. At the same time of year, our standard way to catch these big bullreds is a very similar process. We look for the pelicans diving on the bait the reds are "pushing" to the surface and run to the birds. Slowing down just on the edge of the bird activity, we start casting large artificial baits like topwater plugs or plastic grubs toward the feeding frenzy. Multiple hook ups are the norm when we find schools of feeding redfish. It is actually hard to get your bait back without a redfish attached to it. The cool weather in the winter helps round out what is an incredible time and place for beginners and serious sportsmen alike. Although you are allowed one oversized redfish per person, we encourage catch and release for these mature fish, For one, as a redfish grows, the meat becomes increasingly tough through the years. Also, the big reds are the primary reproducers for this species. You cannot even legally harvest one redfish over 27" in Florida waters. Be sure to read our current fishing reports to see what is biting now.